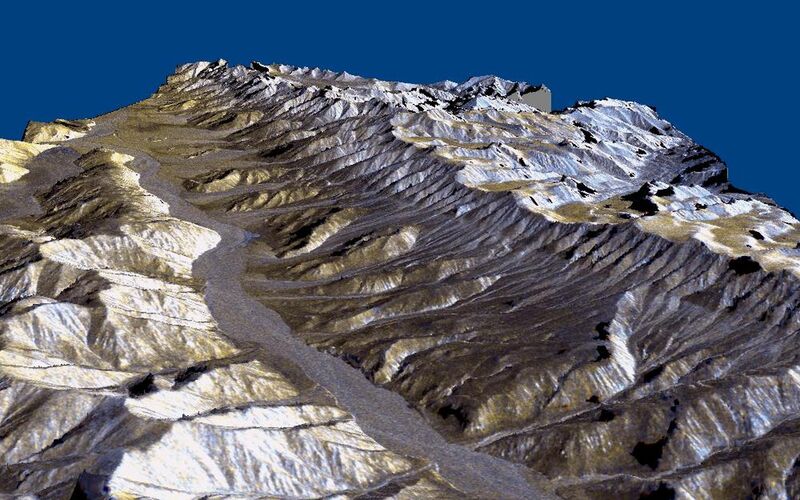 This three-dimensional perspective of the remote Karakax Valley in the northern Tibetan Plateau of western China was created by combining two spaceborne radar images using a technique known as interferometry. 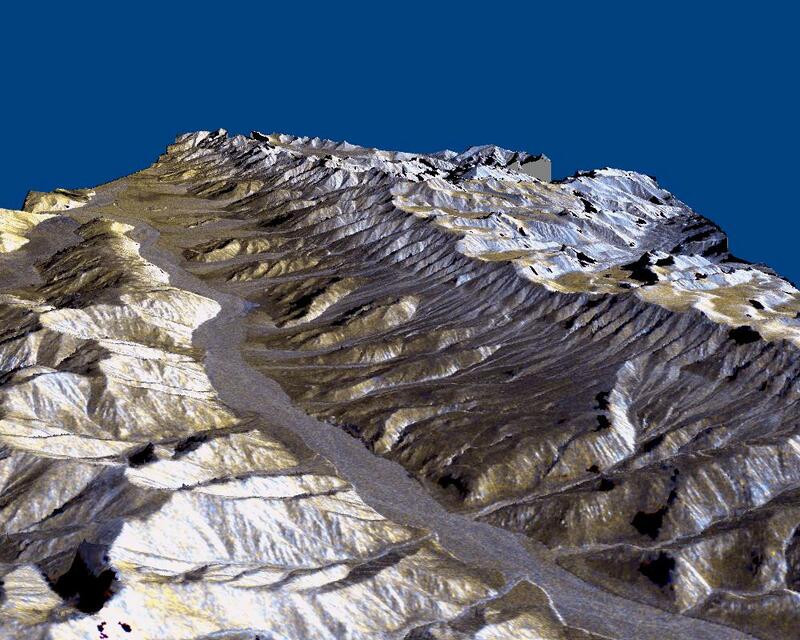 Visualizations like this are helpful to scientists because they reveal where the slopes of the valley are cut by erosion, as well as the accumulations of gravel deposits at the base of the mountains. These gravel deposits, called alluvial fans, are a common landform in desert regions that scientists are mapping in order to learn more about Earth's past climate changes. Higher up the valley side is a clear break in the slope, running straight, just below the ridge line. This is the trace of the Altyn Tagh fault, which is much longer than California's San Andreas fault. Geophysicists are studying this fault for clues it may be able to give them about large faults. Elevations range from 4000 m (13,100 ft) in the valley to over 6000 m (19,700 ft) at the peaks of the glaciated Kun Lun mountains running from the front right towards the back. Scale varies in this perspective view, but the area is about 20 km (12 miles) wide in the middle of the image, and there is no vertical exaggeration. The two radar images were acquired on separate days during the second flight of the Spaceborne Imaging Radar-C/X-band Synthetic Aperture Radar (SIR-C/X-SAR) aboard the space shuttle Endeavour in October 1994. 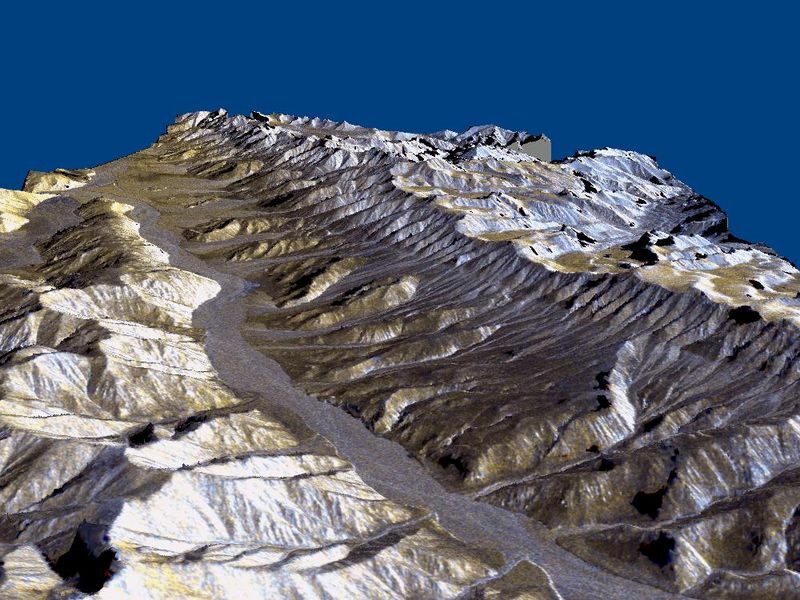 The interferometry technique provides elevation measurements of all points in the scene. The resulting digital topographic map was used to create this view, looking northwest from high over the valley. Variations in the colors can be related to gravel, sand and rock outcrops. This image is centered at 36.1 degrees north latitude, 79.2 degrees east longitude. Radar image data are draped over the topography to provide the color with the following assignments: Red is L-band vertically transmitted, vertically received; green is the average of L-band vertically transmitted, vertically received and C-band vertically transmitted, vertically received; and blue is C-band vertically transmitted, vertically received. SIR-C/X-SAR, a joint mission of the German, Italian and United States space agencies, is part of NASA's Mission to Planet Earth.